La Jolla means "The Jewel" in Spanish. And indeed it is in so many ways. La Jolla, California is a collection of natural picture post cards. Lush greenery, astounding views across the Pacific Ocean, gentle ocean breezes, blue skies, ideal year-round climate, ablaze with colorful flowers, ocean recreation and brilliant sunsets. That's just some of the things that make the Village of La Jolla so special and a favorite vacation spot. One can only imagine how awe-struck Spanish explorer Balboa must have been when he came upon this view from atop the hills of what would become La Jolla, California. Balboa originally named it El Mar Pacifico…. ”the peaceful sea”. Well, it is. Although the Village of La Jolla is an affluent community, there is a refreshing kind of down-to-earth attitude here. Rich yet unpretentious. Homes in the village area are expensive, but at first glance many of them are unassuming but carry some pretty costly price-tags that few could afford. That's primarily because of the views across the beaches and ocean. Few people that live in La Jolla will not be wearing suits and ties, but shorts, tee-shirts and golf hats. That's the way they are, blending with vacationing tourists and the everyday "Joe" that visits some of the most scenic beaches in California. This enclave called the Village of La Jolla, is a serene and relaxing getaway from the stress and rigors of the city hustle-bustle. An environment of Mediterranean style charm and romance blessed with a plethora of beaches each with its own unique characteristics. 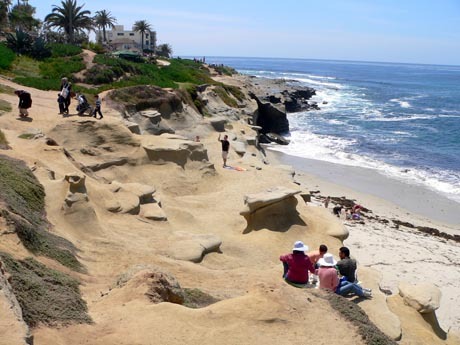 Beaches like La Jolla Shores, La Jolla Cove, Children's Cove and many more. Choose the one you prefer for surfing, kayaking, snorkeling, beach recreation or simply sunbathing with a good book. If you love boutique shopping and one-of -kind restaurants, you will love La Jolla Village where quaint shops are carefully placed along the ocean edges with awe- inspiring scenes that will blow you away. There are piers, ocean preserves of marine life, art galleries and museums. And there are grassy parks like Scripps Park, along the beaches where the whole family can enjoy a picnic amongst the views of beauty. Nearby you'll find a wide variety of motels, full-service hotels and world class resorts. From the north. Take Interstate 5 South. Exit at La Jolla Village Drive. Go west on La Jolla Village Drive, then turn left onto Torrey Pines Road and follow to the intersection of La Jolla Shores Drive and Prospect Street. From the south and east. Take Interstate 15 north and exit on La Jolla Parkway. Continue on La Jolla Parkway to Prospect Street. From San Diego Airport. Go east on North Harbor Drive to Laurel Street and turn left. Follow the signs to Interstate 5 and go north to La Jolla Parkway (about 7 miles). Continue on La Jolla Parkway and turn right onto Prospect Street.